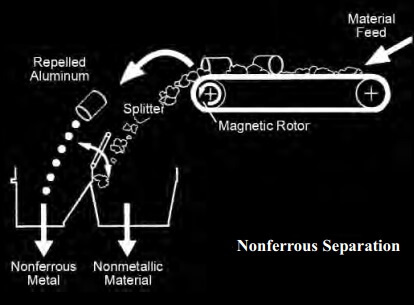 The eddy-current separator was initially developed to recover non-ferrous metals from shredded automobile scrap or municipal solid waste. In these applications the metallic fraction consists of relatively large items such as various crushed automobile engine components or aluminum beverage cans resulting in excellent separation efficencies. The repulsion of aluminum beverage cans from a rotating permanent magnetic field eddy-current separator that is treating municipal waste. 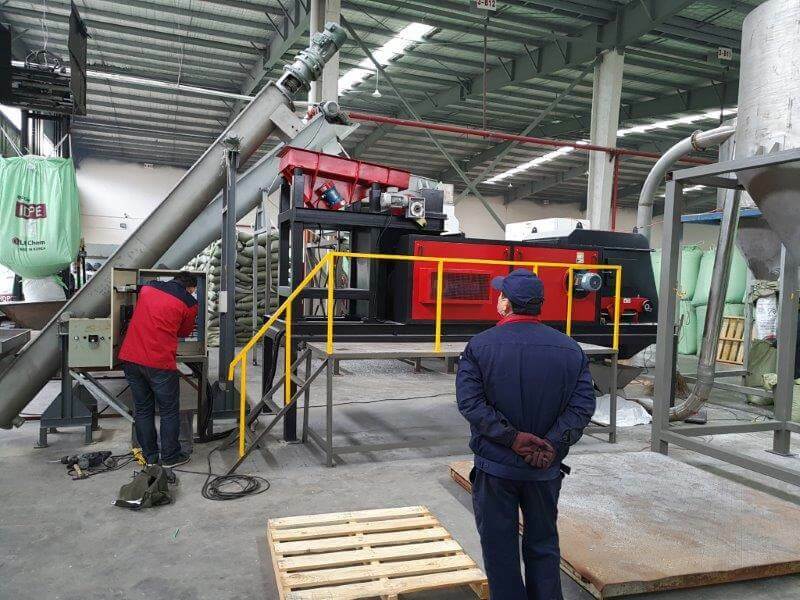 The commercial success of treating automobile scrap and municipal waste led to the investigation of various other secondary recovery applications. A project was initiated in an attempt to better understand the eddy-current metal sorting process on a production scale. Various metal bearing samples (chopped or shredded) were obtained from metal processors, aluminum producers, and foundries to test the eddy-current separation process. In all cases the samples were tested as received to lend credence to the separation. Through this continuing research and testing program that has led to an improved understanding of the separation variables, the applications of the eddy-current separator have progressed to finer materials and subsequently more selective separations. A tabulation of current customer applications that have resulted in effective separations is provided. Several of these applications are currently being carried out on a production scale. Recycling automobile scrap is a common application with over 200 automobile shredders operating domestically. Automobile scrap is generated by reducing a whole automobile with a hammer mill. The top size generally ranges from 6 to 8 inches and the scrap contains high levels of iron and aluminum with minor copper and zinc. Typical eddy-current separations will recover 80-90 percent of the non-ferrous metals into a conductor product containing as high as 95 percent combined metallics. Several various samples containing fine metallic particulates responded favorably with metal recoveries as high as 99.9 percent. Most notably is the separation of aluminum from slags, dross, and foundry sand. Aluminum slags crushed to 4 mm responded in near perfect separations. Aluminum dross sized at approximately 1 x ¼ inch containing high levels of metal responded with a 99.7 percent recovery of the metal. Aluminum foundry sands were tested at various process stages in order to remove residual aluminum particulates. Again, in most cases highly effective separations were achieved. Crushed glass cullet containing brass contacts resulted in a 97.6 percent brass recovery. Electronic scrap varied in the effectiveness of separation but responded well in many instances. Many of the samples consisted of chopped and shredded circuit boards in which a certain degree of difficultly is obtained in preparing the sample for separation. Liberated material responded well resulting in a clean conductor product containing mostly aluminum and copper. Magnetic separation was also effective in removing the ferrous fraction from these samples. One interesting application is the selective sorting of various metals. Samples of mixed iron, aluminum, copper, lead, and zinc, sized at approximately 1 by ¼ inch were tested. While the iron was removed magnetically, an eddy-current separation of the aluminum and copper from the lead and zinc was established. An additional investigation was conducted in order to quantify the magnitude of repulsion on various random sized aluminum components. Several aluminum components were selected from the previous series of separation tests in order to measure and compare repulsion at various frequencies. Of particular interest was the observation of relatively large components of irregular shapes that are commonly produced in a chopping or shredding operation. The components were selected to provide a wide range of shape and weight. The smallest component was a flake weighing 2 grams while the largest component was a 10 inch long bar weighing 378 grams. The components were placed in one of three categories. The first catagory consisted of light weight aluminum flakes and nuggets ranging from 2.0 to 5.8 grams. The second category consisted of medium weight die cast aluminum of random shapes ranging from 9 to 122 grams. The third category consisted of heavy weight aluminum plate that had been produced in a chopping operation. These components resembled bar stock that was twisted and bent and ranged from 82 to 358 grams. Each component was individually subjected to repulsion from the alternating magnetic field of the eddy-current separator. The component was placed on the feed belt and slowly brought into the alternating magnetic field where it was repelled. The distance of the throw was then measured. This procedure was then repeated twice with the same component but placing it with a different orientation on the feed belt. The three readings were averaged. This procedure was done in order to minimize the effect of the orientation on the large irregular components. The test series was conducted at eight rotor speeds ranging from 600 to 2000 rpm to quantify the effect of the frequency of the alternating magnetic field. The repulsion of the light weight aluminum flakes and nuggets and the medium weight die cast aluminum proved to be fairly linear with rotor speed. The lightweight material had a steeper slope than the medium weight material extending from an average repulsion of 25 inches at 600 rpm to 33 inches at 2000 rpm. The medium weight material however had a much greater initial repulsion averaging 34 inches at 600 rpm. Although the slope was flatter than the light weight material, the average repulsion was significantly greater at any given rotor speed due to the greater mass of the components. The heavy weight chopped aluminum plate had a much greater initial repulsion than the other two categories averaging 50 inches at 600 rpm. The average repulsion was also significantly greater at any given rotor speed. There was however a considerable amount of scatter with this heavy weight material. The repulsion spanned a relatively narrow range at a rotor speed of 600 rpm and fanned to an extreme range with increasing rotor speed. Two of the components exhibited a definite negative response to the increase in rotor speed. This would indicate that the optimum rotor speed has been surpassed for these two particular components. The comparative differences in the response of the heavy weight material suggests that the specific shape and thickness of each component is a major factor. Unlike the light weight and medium weight material, the heavy weight plate material experienced extreme twisting, bending, and cracking in the chopping operation. It is anticipated that the irregular shape and the cracking within these components results in multiple induced current loops. The magnetic fields generated from these current loops counteract one another lowering the net repulsive force.